It used to be that if you were going to put on a show, you just put on a show. No need to worry about community concerns, critiques or trigger warnings. No more, as Manitoba Opera has discovered. This spring, the Opera is performing Werther, an opera that romanticizes suicide. In a province like Manitoba, where someone kills themselves every other day on average, and where some northern Indigneous communities have experienced suicide epidemics, putting on a show that inspired copycat suicides can be a real challenge. So, what’s an opera company to do? In the case of Manitoba Opera, you use it as an educational opportunity. 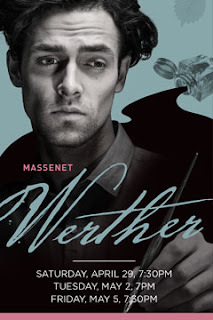 Werther, the opera they are performing, is the 18th century story of a young poet who falls in love with a beautiful woman who is engaged to another man. Unable to have a relationship with her, and to give her up, he finds peace by taking his own life. The story, first published as a novel by Goethe in 1774, was turned into an opera by Jules Massenet in 1887. The publication of the story reportedly led to the so-called “Werther effect”—copy-cat suicides. With this in mind, Manitoba Opera decided to team up with Mood Disorders of Manitoba to promote discussion about the issue of suicide at a panel discussion in April. “We want to use opera as an art form to have a conversation about issues of concern in the community,” says director of marketing Darlene Ronald. In addition to the panel discussion, students attending dress rehearsals will hear a presentation from Mood Disorders about healthy perspectives on love and relationships, and there will be two pages in program about suicide prepared by the organization. For Ronald, providing educational events like the panel discussion is a way for Manitoba Opera to engage the community. “We want to be part of the lives of people in the community, and find ways to connect more strongly with people,” she says. Of course, she also hopes that some who attend the panel discussion—who may never been to the opera before—might also come to hear a performance. But even if they don’t, “we hope they will still be touched by it, and what we are trying to do,” she says. Offering events like this is also a recognition that arts groups can’t just keep operating “in the traditional way,” Ronald says. “The arts are changing, and also how people view them,” she adds, noting that arts groups need to find new ways to connect with audiences. This isn’t the first time Manitoba Opera has reached out in this way. Last year, for the production Of Mice and Men, which features an intellectually disabled character, the Opera teamed up with groups that work with people with intellectual disabilities. In 2014, when the Opera performed Fidelio—the story of a woman seeking to free her husband, a political prisoner, from jail—they used the production to celebrate the opening of the Canadian Museum for Human Rights and also to highlight the plight of political prisoners around the world. Refugees from other countries living in Manitoba were invited to be involved as extras in the performance. The two productions were “a great experience for us, and for our patrons, a great way to talk about these issues and the things we have in common,” Ronald says. Their efforts have been noticed by others, such as Opera America, the association for almost 150 opera companies in North America, and by OperaAnchorage, which used Manitoba Opera’s model to honour veterans. “It was great to see something we did recognized in this way, and rippling through to others,” says Ronald. While glad to offer these extras, she says that it isn’t easy—Manitoba Opera’s staff is small, and resources are tight. I think Manitoba Opera is on to something. At a time when money is tight, audience numbers are declining, and many are questioning the value of the arts, arts organizations need to find new ways to connect to their communities. This includes linking what they do to the issues and concerns of the communities they live in—and that they ask for support, both in terms of attendance and taxpayer dollars. Will it work? Will gestures like this turn around the fortunes of groups like opera companies? It’s hard to know. One thing is for sure, though. At a time when it is hard to get any attention, putting on programs like Manitoba Opera did on suicide can generate additional publicity, including outside of the arts section (as happened for Manitoba Opera in the Winnipeg Free Press city section). And if it makes someone feel more warmly towards Manitoba Opera—even if they never attend a performance—that’s not such a bad thing, either. Doing good is hard work. So is paying for it.